1. Schedule and plan posts better. For a while there, I was pretty good about keeping a schedule and planning my posts ahead of time. However, that just kind of randomly died out with a whimper. In 2015, I really want to be intentional about visualizing what I want the coming month to look like at Distracted Blogger, and planning/scheduling posts to meet that vision. …but once the scheduling fell to the wayside, so did the promotion. In the coming year, I really want to focus and plan ways to find more readers to add to the existing bunch of awesome and amazing readers that are already here! ..which means I have to be really intentional when it comes to engaging with other humans. I plan to use 2015 to really plug in to the geek blog community. Besides, I genuinely like the women who populate the Female Geek Bloggers group, so I’d like to virtually hang out with them more. 4. Update the blog’s look. I don’t know what I want specifically, but I’m always trying to see what I can find to make the site look more slick and more professional. While I don’t think I’ll ever have the perfect page, I want my site to continue to grow and evolve, both content-wise and in how it looks. Last year I got the awesome Kerry from Kerry’s Nerdy Habitat to design me some logos and banners for the site, and that really added a touch of awesome. So I’m really going to have to get creative if I want to top Kerry’s amazing work on my site! 5. Add more of me into my blog. I write a lot of news stuff and opinion stuff, and I like writing that. However, I’d like to find a way to infuse a bit of me into the blog as well. I’m not sure what exactly that will look like, or what I’m even trying for here. I don’t want this to turn into my own personal diary of a blog by any means. However, I’ve often wanted to talk a bit about stuff I geek out about apart from your traditional geekery. Namely, I’ve wanted to talk about my ballet endeavors around here, but I haven’t really found the best way. In 2015, I’d like to figure out some sort of a monthly or every-other-monthly “ballet break” of a post. I don’t know what it will look like, but I think it could be cool. I do tend to talk about ballet more on my Twitter and Instagram (like my pic below from this year’s Nutcracker). So if nothing else, I’ll at least have some ballet stuff there. What are some of your New Year’s resolutions, blogging-focused or otherwise? What are some things you’d like to see here on the blog? Let me know in the comments! 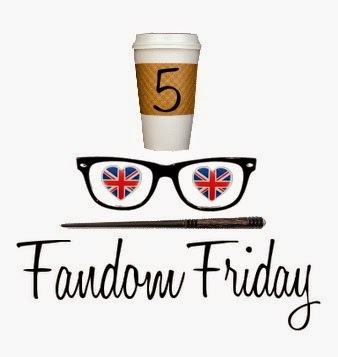 And, as always, be sure to check out my other Fandom 5 posts, and see what other bloggers are resolving by following the hashtag, #Fandom5. Kendall! I love all these things! I am really excited for you 🙂 Having fun goals & dreams like this lead to an adventure – so excited to see more of you in this place. Aw, thanks, Beth! I’m excited to see what the year will bring! I need to get better at scheduling my posts too! I just get so distracted sometimes… Grrr. Anyways, good luck with the rest of your goals too! Hope you have a great weekend! Haha seriously. Getting organized can be a bear, but I NEED to do it! Great list! Here’s hoping for an awesome 2015! Oooh, I’m excited for some nerd crafting! As a fellow introvert, I feel your pain on the promotion/interacting front. I’m excited about the nerd crafting, too. It’s a super fun past time!